Besides a few light bulbs on, and a small heater down in the uninsulated part of the cellar (to keep the pipes from freezing) there wasn’t much the the way of heat sources, yet the house was still warm. It was a little on the chilly side, but we like that – that’s pretty much how we want to keep the house during the winter months. Cold enough to warrant wearing a light sweater or hoodie, but not so cold that our hands get cold. It appears the heat was coming from the building next to ours – 166 West 123. Despite the fact that 166 is sandwiched between two cold, unheated shells it remarkably has no insulation in the party walls. I can’t imagine what their heating bills must look like – they’re radiating so much heat that it’s enough to keep multiple buildings warm. All the buildings next to them have to do is insulate well and trap 166’s heat. I would feel guilty about having our neighbor heating our building for us but it’s costing them less than when our building was open to the elements and the party wall was freezing cold. The core principles of conservation are Reduce, Reuse, Recycle. To that end we’ve Reduced our neighbor’s energy usage, and Reused their radiated heat. It’s pretty much a win-win. Even without a sweater I found the temperature yesterday to be pretty comfortable. What that means is that we probably won’t need to turn the heat on in our building until it gets down into the 30s and even then it doesn’t look like we’ll need much heat. The moral of the story is closed cell foam is pretty incredible – and while it’s a bit more expensive upfront, it’ll save us far more money than it cost. It’s gotten colder since I wrote the post and I’ve figured out the house is comfortable down to roughly freezing. I was comfortable at 35 degrees outside with a 10 mph wind, but it was maybe 5 degrees too cold when it was 27 outside with a 14 mph wind. Even at 27 out the temperature wasn’t that bad. A hoodie or sweater would have made it comfortable enough except hands would have been a bit cold. And as a temperature for sleeping – it could even get colder inside with a proper down or wool blanket. Today we finally got thermometers. The temperature outside was 32 degrees but inside it was 51 degrees on the parlor floor (the coldest part of our unit) and 52 degrees near the window in the cellar of the rental unit (the coldest part of the rental unit). That’s pretty sweet – we get 20 degrees of heat off light bulbs and from the warm wall with the neighbor. We also noticed at lower temperatures the heat gained is even more. I first wrote this about a year ago when Dan and I went through a LEED certified townhouse that was for sale, but I was afraid my wording was too harsh, so I never published it. But a year later the place still hasn’t sold so I’m stripping out the details of which house it is, reworking some parts, and putting up the post. The townhouse we saw is a gut renovated townhouse that was one of the first to get LEED certification (it achieved “silver” certification). Everything in this townhouse is “green”. The plywood is green (at 3 times the cost), the dumpsters of garbage were recycled (a 1.5 times the cost), the paint is “green” (and I’m not referring to the color), there are 3 huge solar panels on the roof, the insulation is incredible (composed of things like closed cell foam and recycled blue jeans), the heating and cooling very high efficiency – EVERYTHING about the house is green. The project is even got fairly substantial national recognition and had all sorts of big name sponsors (who donated things like appliances). When we went through the house another couple was also looking at it. As they left a guy shouted to them from a van “how much are they asking for that place?” Their answer summed it up nicely – “Too much”. The asking price at that time was $2.79M down from an initial asking price of $2.995M when they put it on the market two years ago (it’s now down several hundred thousand more). Simply put, NOTHING in Harlem is selling for that price. The top of the market right now is about $2M, and things were selling for even less two years ago when they priced it at $3M. Compared to other townhouses at the high end of the market this one’s primary advantage is all the green technology, but the question is how much will someone really pay to be green? A million dollars? That’s a lot of money. The layout to me just seemed odd. The living room was TINY, the dining room HUGE, there are huge wide hallways with wasted space throughout the building. On one floor there are two bathrooms across the hall from each other – you’d think they’d connect at least one to the bedrooms that were right next to them. The workspace for the kid’s computers didn’t make a lot of sense to me. I understand why parents might like that, but aren’t parents buying laptops for kids these days? Plus it’s incredibly specific to a particular market segment. You have to have kids of a certain age to find that a good feature. That said, the top floor master bedroom suite was pretty nice. The terrace off the master bedroom was extremely pleasant. For some reason after doing all that work, the owners still haven’t gotten a new C of O three years later. Legally it’s still a C5 Rooming House that’s SRO restricted. The renovations were done legally, but for one reason or another they never took the final step. I can see on the DOB website that they put some more work into it last year, but still no C of O. When they do get it, the plan was for it to be a single family home which seems odd to me. That’s just too big of a house to be single family. 2 family with a ground floor rental is a lot more practical. In fact they’ve set it up for a 2 family, put in the plumbing, etc. Why they didn’t file to convert it to a 2 family to start with, I just don’t understand. While there were some very nice aspects to the house, overall the finishes were of uneven quality. The stairs are a good example. They have this cool LED lighting that’s a very nice touch, but apparently the budget was tight and they couldn’t finish the stairs the way they wanted to and so they covered the center railing with sheetrock with the metal end posts poking through (and the metal was rusting). At $3M (or any price over $2M) people expect better finishes. The odd layout and wasted space make it difficult to price. I think the new square footage is about 5000 sq. ft – which is quite big – especially for a single family home. If it weren’t for the inefficient use of space $450 to $500/sq. ft. would be reasonable based on the comps and that would come out to between $2.25M to $2.5M. Based on square footage they’re finally priced right. But my gut tells me it won’t sell for that ’cause it’s got the “issues” I talk about above. I’d guess the sale price will be closer to $2M – possibly even lower. The issue is that they purchased the place in early 2008 (really bad timing) for $1.45M and given the fact that they did a rather expensive renovation that included major structural work and absurdly expensive “green” materials, I’m guessing they’ll lose money – even at their current asking price the losses could be substantial. If they’re paying a mortgage it gets even worse given high carrying charges. It’s sorta sad to see a demonstration project of green architecture end in people losing money, but that seems to be the likely outcome. While I think it’s great to be green, I don’t see the point of being green at all costs. From what I’ve read LEED is an absurdly difficult standard for existing structures, but the owners and their sponsors had committed to living by LEED and by the time the expenses were mounting and the market crashing it was too late – the financial damage had been done. In my mind the project points out that LEED isn’t a standard Harlem townhouse renovators should strive to live by. Instead, be green in ways that are practical and relevant to what we’re working with – old, imperfect buildings. And be less dogmatic about the whole green thing… For example plywood is green by it’s very nature since it’s made up of wood byproducts that are waste material, or “junk” wood from young trees that come from well-managed, renewable forests. You’re really not achieving much by paying 3 times more for “green” plywood. To me energy efficiency is the name of the game. 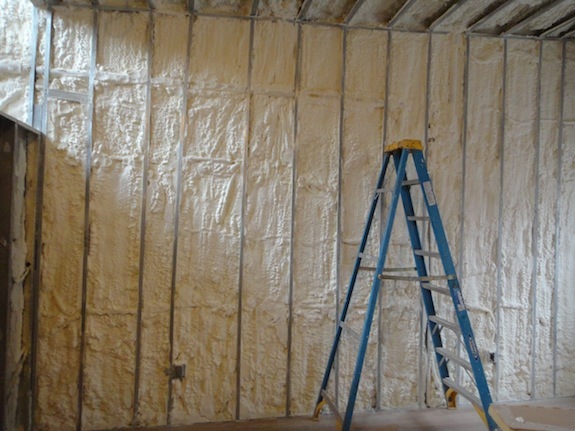 Use closed cell foam insulation when possible. Have efficient boilers and zoned heating and cooling. Have energy efficient windows. But don’t try to be so green that it causes you financial problems. Done properly being green should benefit your bottom line – not hurt it. The other night when we were having drinks with Peter Holtzman, who owns one of the Astor Row townhouses and is an architect with The Downtown Group, the question of how to handle tenants’ utilities came up. His approach was to go all out for efficiency. He has one high efficiency boiler that provides heat and hot water for him and his two tenants. He doesn’t even have hot water heaters – just an insulated tank attached to his boiler. It’s worked for him – he’s got very low utility bills to show for it. Our approach is different, but it’s only different – I don’t know that either of us can say our approach is better. We’re going to sacrifice a little bit of efficiency to emphasize conservation. To achieve this we’re having the tenants pay for many of their own utilities. For example we’ll meter the water separately. We figure if the tenants are aware of the cost of their water, they’ll use less of it. In a similar vein we’re giving them their own hot water heater which will be powered by their (separately metered) gas. Again, if they see the cost of their hot water they’re more likely to use less of it. With heat it’s a bit more complicated. If we provide heat, NYC requires that it be up to a certain temperatures. We want our own unit cooler than the legal minimums – we like a little chill in the air. So we’re shooting for “a bit cool” but not so cool that our hands will get cold. To us that temperature is invigorating. For other people it just feels cold. We’ll extend the concept of awareness leading to conservation by giving our tenants combo heating/cooling units so they can raise the temperature in their unit even higher if they like a warmer apartment. But the supplemental heat will be electric heat and the cost of the additional heat will show up in their electric bill. There’s another difference between Peter’s approach and our approach – ours requires a lot more equipment. We’ll have a boiler, two water heaters, as well as mini-split units for supplemental heat for the tenants. He just has a boiler. If you’re strict in your approach to being green you do need to consider the carbon footprint of making and maintaining that extra equipment (we’re not that fussy in our approach). Where we agreed with Peter was on using closed cell foam to insulate all the exterior walls. 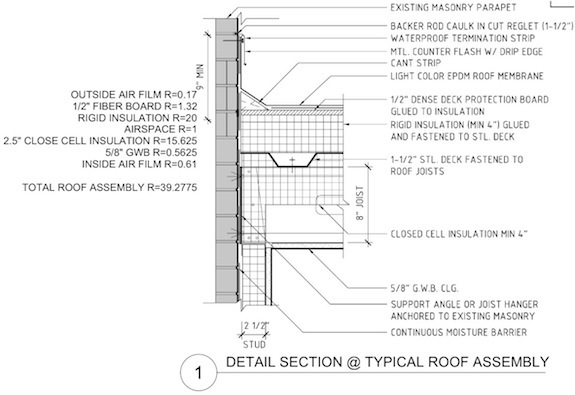 The 2 1/2 inches of closed cell foam, plus everything else in the wall will give our exterior walls an r-value of R20. That will drive down utility bills for everyone, require a smaller heating and cooling system, etc. But it’s beyond that point where you need to figure out which you like better – maximum efficiency, or slightly less efficiency with an emphasis on conservation. Choosing the right windows for our townhouse is a lot more complicated than you’d think. 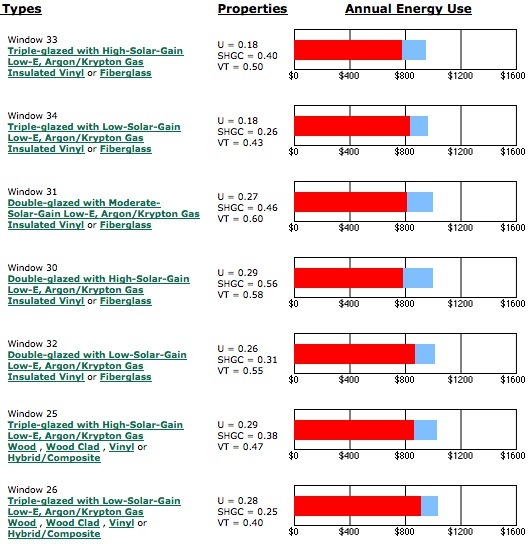 The best website for guidance is EfficientWindows.org which has a page dedicated to what the effect of different choices will be on your heating and cooling bills. Here’s a screenshot showing what the top choices are (click on the image to see more). “U” is “U-Factor” which measures the insulating value of the window. The lower the better. “SHGC” is the Solar Heat Gain Coefficient which measures how much solar rays can heat the building. It’s a proportion, so an SHGC of 0.26 means that 26% of the sun’s heat gets through the window and 74% is blocked. “VT” is the visible light that’s transmitted. It’s also a proportion, so a VT of 0.50 means 50% of the visible light is transmitted through the window. The higher this value, the brighter your room will be. The problem is that they assume that you’re installing the same types of windows in all the windows in your house and that you heat and cool your house evenly. Neither of those assumptions are true for us. The other issue is balancing the windows effect on heating and cooling. The U-value is going to determine how much the outside temperature affects the inside temperature. You want well insulated windows so on cold or hot days the temperature inside the building isn’t affected. This means you want as low of a U-factor as possible. However, with solar heat gain it gets a lot more complicated. The more solar heat gain you have, the lower your heating bills will be, but the higher your cooling bills will be. If you’ve heard of “passive houses” the idea is that they want solar heat gain in the winter and try to avoid it in the summer. They’ll have concrete floors on the south to absorb and store solar heat in the winter, but then they’ll have overhangs that block solar heat gain as the sun climbs in the summer. Passive houses are all about being intelligent about solar heat gain. I don’t like to be in overly sunny rooms. I often cross the street to get out of the sun and I hate sunny places like Arizona and Southern California. So I don’t want a whole lot of visible light transmission on the southern windows. Your taste may differ – many people like direct sun – I’m just not one of them. The SHGC you want depends on how you have your house arranged. In reading Julia Angwin’s blog on the Wall Street Journal I see she’s taking a very different tack than we are. She specifically said “We chose the south side for our office so we could have good light during the day.” (source) She and her husband are clearly people who like direct sunlight. In my mind “good light” is indirect northern light, so I want our home office on the north side. I would hate Julia’s south-facing office, but that’s just me… In addition to light issues I want the office on the front because the street is noisy and I can tolerate more noise in the office than I can in the bedroom when I’m trying to sleep. I say all of that for a purpose. How you arrange your house will have an impact on what SHGC value you shoot for on your southern windows. In our case our primary daytime room (the home office) will be on the north side of the building. Solar heat gain is not going to affect our air conditioning bills too much on weekdays because we’re not in sunny rooms during the day – just maybe a bit on weekends when we use more rooms in the house during peak cooling hours. On the other hand Julia Angwin is spending time during peak cooling hours in a south facing room. A low SHGC value is far more important to her than it is to us. In addition, unlike Julia and her husband, we’ll be providing heat for our ground floor tenants. On top of that, since we’re going with a mini-split system for cooling every room will be a zone for cooling and we can just cool the room(s) we’re in. But heating will be more general. While we can turn off the rads in rooms, there’s a certain level of heat we have to maintain throughout the house. As a result, I’m expecting heating to be a bigger expense than cooling. That means we’ll benefit by having somewhat higher SHGC values on the south facing windows… If you look at the graphic above you’ll see the two scenarios where the heating cost was below $800 had very different SHGC values – 0.40 in one case and 0.56 in the other. Lower isn’t necessarily better when it comes to SHGC. If you’re in Miami it is, but not NYC. The other issue that’s important to us when it comes to windows is how much UV is blocked. I remember visiting my sister’s friend’s apartment when I was in college. They had an incredible place in San Francisco with water views. Problem was their windows let through too much UV and it ruined a Matisse color block collage they had bought. We’re a bit paranoid about UV affecting our art and furniture. That means that UV protection will be a huge issue for us on south facing windows (and somewhat on north facing windows). And to make things even more complicated, I think we’ll be getting Gaulhofer windows (from Austria) and Europeans measure a lot of these values differently (especially SHGC) so I’ve been struggling to convert European values into US values. But Gaulhofers are just incredible windows – their standard window is tilt-n-turn (an inswing casement that can also open a little at the top to allow ventilation), and they’re made with furniture grade wood – not the cheap crappy pine Marvin and Andersen use.